My uncle was coming over again, another one of my kids had a birthday party, so I had to come up with a new dessert. 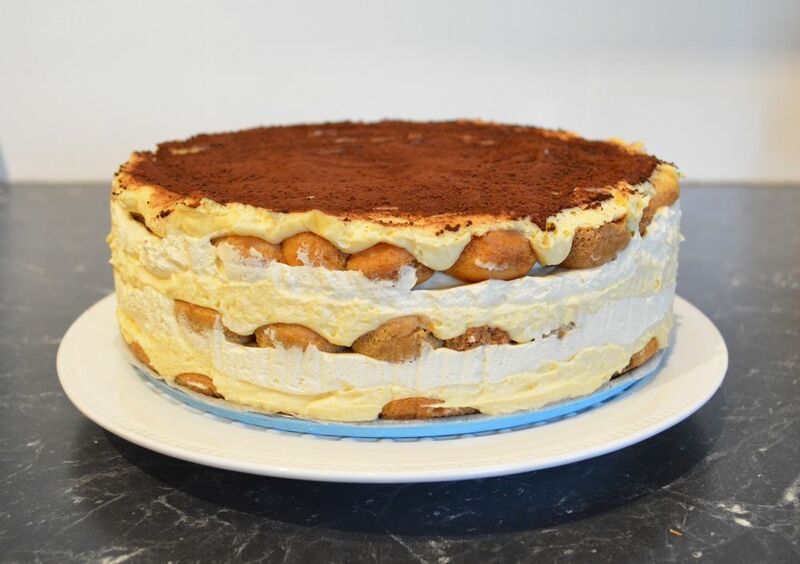 This time my focus was my mother though, she loves desserts and she loves coffee flavoured desserts, and for ages she has been trying to get me to make a new version of a Tiramisu. Now I love my Mocha Tiramisu that I have been making for years, it has been a favourite of mine for over 20 years. But when I came across this recipe from a magazine clipping recently, I thought I'd give it a try. This one only used rum. Now rum is something I like in my drinks, and I'm quite happy to try different types of rum, but for this dessert, there was only one rum that I really liked and it is the Croatian one pictured below. Although I don't like to drink it, as it really is a Croatian liqueur with the addition of Rum Flavour, it has the most amazing aroma, it smells so good and what you smell is what you taste in your desserts. It truly can make a cake taste amazing. So for this recipe, try and get your hands on a bottle of this, it will truly make this tiramisu taste amazing. I also sprinkle it on my madarica now, it just is beautiful. So my new cake was a hit, my mother loved it, my uncle thought it was nice, my other guests thought it was lovely, even my daughter the party girl loved it. It really is a lovely dessert cake. What I added to this recipe that wasn't in the original recipe was what I also put in my mocha tiramisu which is Hazelnut chocolate. 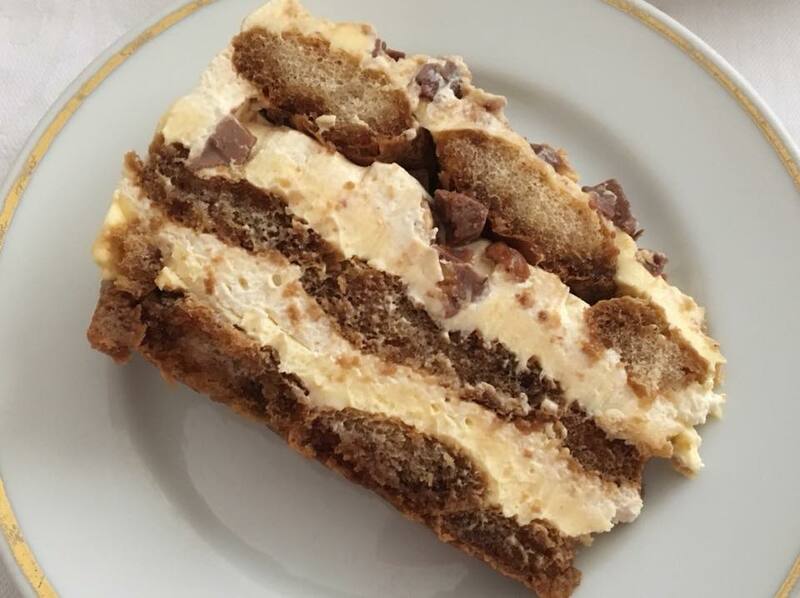 I find although I love tiramisu, it can be texturally just mushy and creamy, by adding coarsely chopped chunks of hazelnut chocolate, you add a bit of bite to the cake, which I just love. Also the original recipe used 450g mascarpone, but I put in 500g, as my mascarpone comes in 250g tubs, so two tubs make 500g, and I refuse to throw out 50g, so if your tubs are 250g each, just add all of it, works just fine. If you can get 450g tubs, add just 450g. So if you are having people over, this is a great cake to try, it can be made up to two days ahead of time and it looks and tastes great. I can see this cake being made a lot over the next few years, we loved it, hope you do to. In a medium saucepan, whisk together the egg yolks and 150g of the sugar until combined. Place over a medium heat, slowly whisk in the milk. When the mixture begins to boil, reduce the heat, continue whisking and simmer for 8-10 minutes, then remove from the heat, pour into a clean bowl and allow to cool. I whisk it every now and then so it cools quicker. When cooled to room temperature, cover the mixture and place in the refrigerator for one hour. After an hour, in a clean bowl, add the cream and vanilla extract. Use a clean hand mixer, with the whisk attachment, whisk the cream and vanilla together until the mixture forms stiff peaks. Once the egg yolk mixture has cooled, use the same hand mixer and beaters, no need to clean them, whisk the mixture until it thickens slightly. Add the mascarpone and whisk until smooth. Combine the coffee, remaining sugar and rum. Mix until the sugar is dissolved, then allow to cool to room temperature. Line the base and sides of a 20cm round springform tin with baking paper, make sure the paper extends above the cake tin by 3cm. Dip each savoiardi biscuit in the coffee mixture for 1-2 seconds to soak. 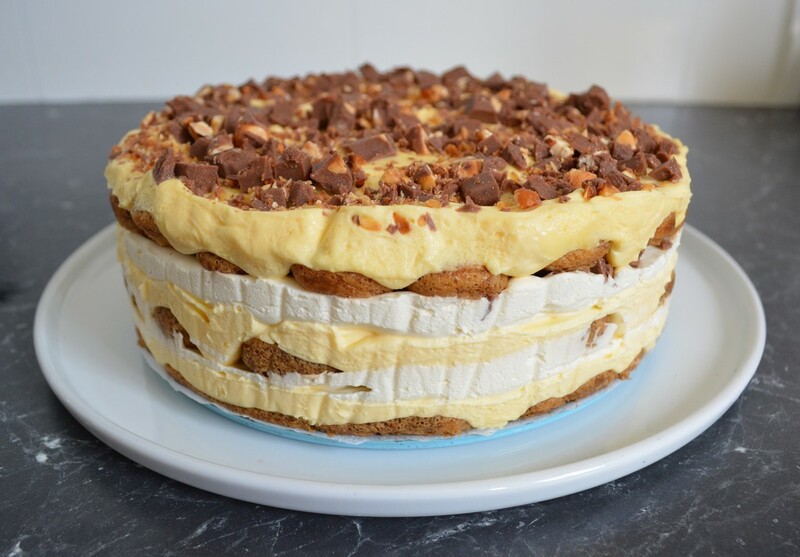 In your prepared cake tin, build the tiramisu. Begin with a layer of coffee dipped savoiardi biscuits, breaking them to fit where necessary. Add one third of the mascarpone mixture, spread it out evenly, then half of the whipped cream, spread out evenly. Scatter over half of the chopped hazelnut chocolate. Now add on another layer of the coffee dipped savoiardi biscuits, half of the remaining mascarpone mixture, and all of the remaining whipped cream. Scatter over the remaining chocolate. Finally add another layer of coffee dipped savoiardi biscuits and the remaining mascarpone mixture. Using a sifter, dust a layer of cocoa powder over the top. Cover loosely with cling film and refrigerate for 24-48 hours before serving. To serve, carefully remove the sides of the baking tin, gently peel away the baking paper on the sides. Trim the base baking paper but leave the cake tin base on, it will collapse if you try to remove it, place on a serving platter, serve cold.